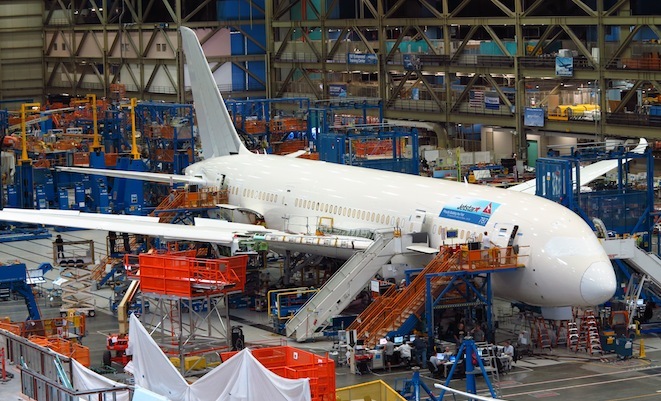 The first 787 for Jetstar has entered final assembly at Boeing’s Everett factory ahead of its planned delivery in late September. 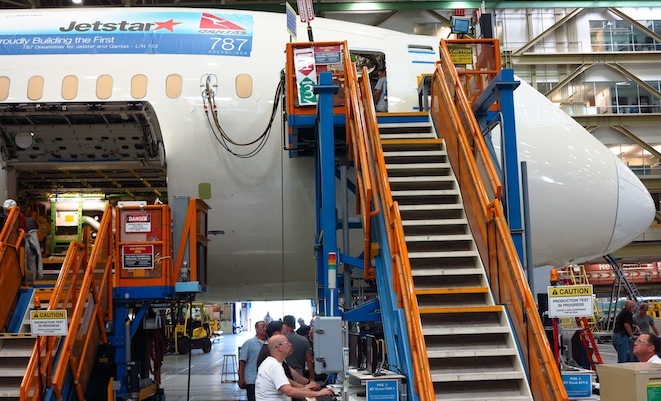 The aircraft, to be registered VH-VKA, is due to enter service on Jetstar’s domestic network in Australia in November before transitioning to international flights from December, the airline’s director of Boeing 787 program Mark Dal Pra announced at Everett on June 3. The domestic flights, likely to include services from Melbourne and Sydney to the Gold Coast and Cairns, will follow a period of crew training and familiarisation. Dal Pra also confirmed that Jetstar’s 14 787-8s will be configured in a 335-seat configuration, featuring 21 Recaro recliner business class seats in a 2+3+2 configuration and 314 slimline Pinnacle economy seats at nine abreast (3+3+3) and Panasonic’s eX2 inflight entertainment system. Seat pitch in both classes will be similar to that on Jetstar’s A330s. Jetstar will use the 14 787s to replace its existing fleet of Airbus A330-200s on long haul international services. 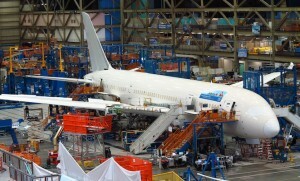 Eleven 787s are due to be service by 2015, allowing the transfer of the A330s to parent Qantas. Nice, I might try to grab a seat on one of the domestic hops. Does this configuration surprise me ?…..Not one bit, because Jetstar is a Low Cost Carrier & in order to keep their costs down they cram as many pax into their planes as are allowed. When VH-VKA is added to the Australian Civil Register it will be the first time that all Boeing commercial types (707,717,727,737,747,757,767,777 & 787) have appeared on the Australian register. 757 were registered to Ansett Worldwide. One of these aircraft was unfortunately lost in a airborne collision over Lake Constance, Switzerland on 01/07/2002. I’m certainly looking forward to a new chapter in Australian Aviation History with the introduction of the 787. It certainly has been a long wait but one I think the public will be inpressed at what the 787 brings to the table. What is joyce think of giving 787 to jetstar and for getting he is ceo of qantas. Start looking after qantas mr joyce! This aircraft should be entering service wearing Qantas colors! The state of our once proud airline is disgraceful! B787 is most advance aircraft to be landing In this blessed land of Australia. 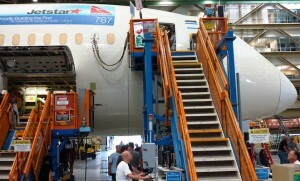 Jetstar will take advantage to implement such aircraft to customers on Australian skyline and beyond. Mr Joyce is looking after all members of company belonging to Qantas including Jetstar naturally. I say, Qantas have opportunity to go for Airbus A350-900 or 1000, and advancing future position of this icon under Southern Cross.